The death of a Muslim teen in December, which fueled wide speculation about an anti-Muslim attack, was the result of a fall that followed the teen’s first use of marijuana, according to a report released Tuesday by Seattle police. Hamza Warsame’s death Dec. 5 drew national attention and sparked widespread speculation that he might have been the victim of an anti-Muslim hate crime, until it was ruled an accident a month later. A report released Tuesday by Seattle police reveals details of the investigation that bolster the conclusion made by the King County Medical Examiner’s Office. A toxicology screen by the medical examiner found “relatively high levels” of tetrahydrocannabinol, the main psychoactive constituent in marijuana, in Warsame’s system. Almost immediately after news of Warsame’s death spread, rumors about an anti-Muslim assault began to circulate on social media. Seattle City Councilwoman Kshama Sawant joined the fray, calling for an investigation into the death of the Somali teenager. On her blog, she wrote that anti-Muslim rhetoric had spiked after recent terrorist attacks in Paris and San Bernardino, Calif. “Some reports suggest he was beaten and thrown from the building in an Islamophobic attack by a fellow student,” she wrote. Police interviewed the neighbor in the apartment below, who told them she was usually able to hear some things that happened in the upstairs apartment quite well, even making out specific words. But she did not hear any fighting or struggling on the day Warsame died, according to the police report. 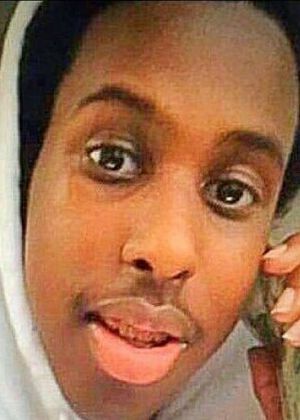 Police said the medical examiner concluded Warsame’s death was an accident and police speculated he had perhaps tried to jump to an adjacent building at 510 E. Thomas St. that is 11.5 feet away from the Summit Avenue building from which the teen plummeted. Police said Warsame was 1.5 feet short of reaching the other building’s roof.